That’s the irony at the heart of GM’s event this week at its Flint, Mich., factory, where the next iterations of the Chevrolet Silverado and GMC Sierra will be introduced. These revamped heavy-duty pickups, which go on sale in June, feature advanced, lightweight materials and fuel-efficient engines but none of the technology that supposedly will shape the next era of the auto industry. Yet in Detroit, that future can’t exist without the profit margins generated by classic pickup trucks. GM’s pickup trucks combine for $65 billion in annual revenue. Heavy-duty versions of the Silverado and Sierra make up about 20% of GM’s full-size truck sales, the company said, and sell at an average of almost $56,000. Competition in the segment is fierce: Ford Motor Co. is rolling out freshened version of its leading Super Duty models at this week’s Chicago Auto Show. The math makes it clear that GM will ride into the future on trucks that first went on sale decades ago. The operating profit on large pickups, according to Morningstar Inc. analyst David Whiston, are at least $12,000 apiece. GM reported sales of 210,000 heavy-duty pickups last year and hopes the new ones will sell even more. They bring in more than $2 billion in pre-tax income. That alone covers the $1 billion a year that the automaker puts into its GM Cruise elf-driving unit, which has yet to bring in revenue and will only begin to pilot a ride-hailing service later this year. The investment required to solve the complex problem of getting a computer to drive a car is so expensive that GM sold a piece of Cruise to SoftBank Vision Fund for $2.25 billion and another stake to Honda Motor Co. for $2.75 billion. GM’s truck program also does the most to help fill the financial hole created by the company’s electric vehicle program. In 2016, its first year available, each Chevy Bolt electric car sold lost about $9,000 for the automaker. Those losses only scratch the surface of overall spending on development of next-generation cars. By 2022, the global auto industry will spend $255 billion on EVs and another $61 billion developing self-drive technology, according to a report last year from consulting firm AlixPartners. Of course, GM makes money on other models besides big pickups — just not as much. A Chevy Equinox crossover SUV may only bring in about $3,000 in operating profit. A vehicle such as a Chevy Malibu sedan makes even less. Passenger cars often lose money for U.S. automakers, especially if the factories building them run at less than 70% of their production capacity. Several GM car plants are running on one shift, which means they are likely losing money, and the compact car factory in Ohio and a sedan plant in Detroit are slated to close. 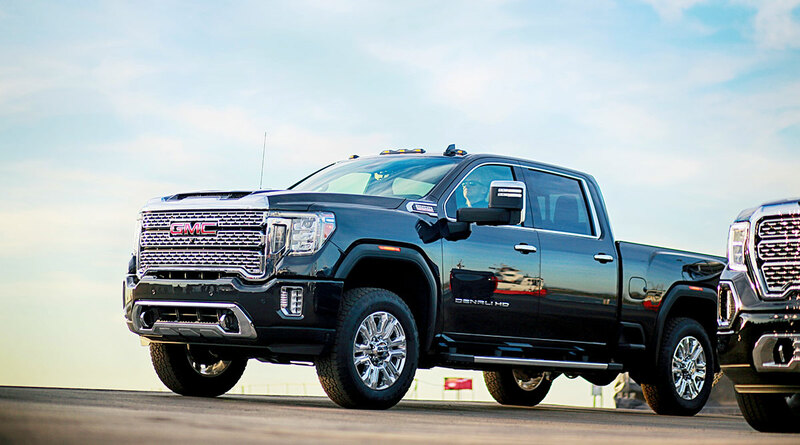 “It’s big, it’s bold and it’s exactly what heavy-duty customers want,” Reuss said additional 170,000 of its Chevy Colorado and GMC Canyon midsize pickups, which also make nice margins. The Bolt EV didn’t crack 20,000 in the United States, and it loses money. Selling electric cars these days is about scaling up battery technology, driving down the cost and preparing for tomorrow. Selling trucks is how GM generates much of the estimated $9 billion a year in profit it has earned for three years running. In the pickup race, Ford traditionally has had more customers for its biggest pickups than GM and sold about 55,000 more than its rival last year. That’s an opportunity for GM, said Dan Ammann, the former company president who now is CEO of GM Cruise, at an investor presentation last year. The automaker has about 37% of the market for trucks priced between $35,000 and $55,000, he said, but only 27% of the market for trucks priced above $55,000. Those are mostly heavy duty trucks. Even holding share will help GM fund the technologies of tomorrow. CEO Mary Barra told investors in January that these trucks will be the profit engine for a long time. Autonomous ride services will become a phenomenon in cities before they hit the heartland. The drivers who prefer Silverados have a need that isn’t easily replaced by autonomous vehicles.